So I worked on my Wings of Love sampler for my cousin's wedding. It's not called that, it's called Couers en Boites but it is how I got it into this month's theme. I also shared this photo of how I like to stitch the RRs. Because I'm only using a length or two of each colour it doesn't seem worth pulling out all the colours so I just get my full set and select the colour I need for the piece I'm stitching that evening. It makes a nice spread on the table!! You can see my lovely coloured-in copy of the chart in front of me. And my small ORTS tin ready to be added to the ORTS jar for TUSAL day. Finally, I sent the latest postcard in the Summer Blog Hop to Evalina but it's not up yet so watch her blog!! I am expecting one more picture in then I will email the final ones out in one big end of summer flurry! And here is Dragonlet number 8, crying over his spilt milk. Doesn't he know it's no use crying over it? Here are the eight I've stitched so far, the plan is to cover 12 little boxes with them and make a post-Christmas 12 Days calendar with a little gift in each box starting 26th December and finishing on Epiphany. I just need to find 12 small gifts, I have 2 so far plus the idea of a chocolate! Here is the cute little skeleton pair from Just Cross Stitch Hallowe'en Special. They are nearly all beads and great fun to stitch. 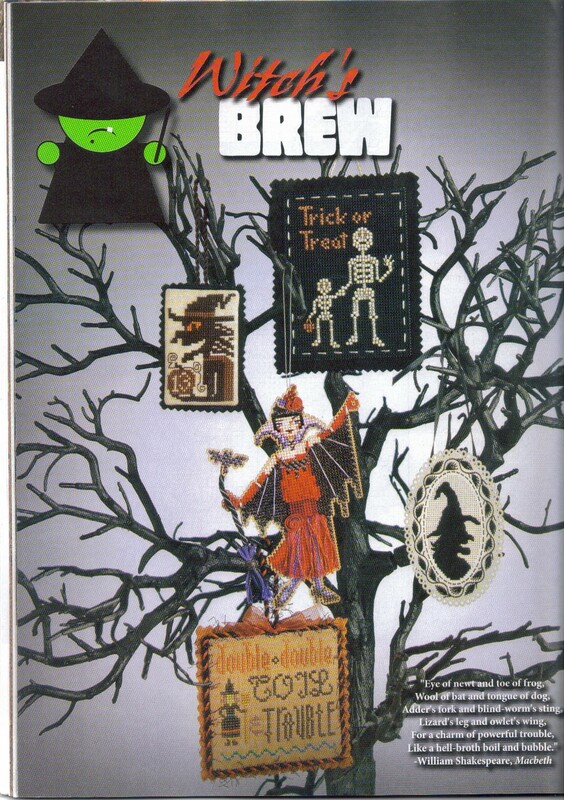 I have decided to make my ornies into little open topped bags and put chocolates in each one on our Hallowe'en tree. We are having a Hallowe'en tree for the first time this year. I'll try find something suitable or I might just go into the field and chop a branch off a tree!! Julia Lucas Designs - Trick or Treat, 28 count evenweave. While I was googling Julia's name (because I'd not heard of her before, I found this cool feature on Cyberstitchers website. They list many designers and the places you can find their designs. It seems Julia has designed alot for various different magazines. Now I can look through and see which ones I already have. Great! And now, a little stash enhancement! I was lucky enough to win another Willow Fabric voucher from having a FB tip printed in Cross Stitch Collection magazine. I think it's the third or fourth one? Anyway, they have a sale on and I got these two half metres of 32 count for a mere £6 each. One is tobacco and one is cognac. I also needed some beads for the Mirabilia RR design which I bought from Sewandso. I think there is an issue with their website because while I was adding some #8 perle to my basket this Just Nan chart appeared in my basket. Weird. Finally, if you are a fan of Fairy Tales, the Little Stitcher or Advent Calendars then this is the SAL for you! Organised by Angi of My Happy Memories we will be SAL the Little Stitcher's Fairy Tale Advent Calendar. I first saw these 24 small designs on Carin's blog last year. You really need to check out her beautiful photography. Start here and work through each day by clicking on the "newer post" after all the comments. Every month Christine sets up a Stitching Challenge on the Needlecraft Haven Yuku Board. 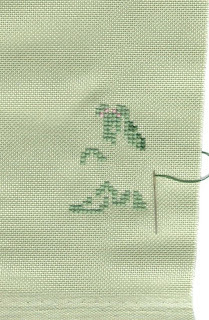 She chooses a different freebie for us to stitch and finish then the Big Reveal Day is the last Sunday of the month. Over the Summer she combined July and August with two charts chosen. I just managed to finish July's design from Martine at Broderies Passion but only just, I was still stitching it this lunchtime! The other design is by Vavi, now I need a small square to fill the gap and I can embellishment the page with some ribbons and roses. The pillow is my least favourite part so I am alternating between a length of pillow and a length of drape as my reward! I probably won't post anymore photos of this until Andie receives it back. I think it's nice for the original stitcher to be the first person to see their completed piece. As promised, here are some photos of my cousin's AMAZING wedding cake. Apparently it surpassed even her imagination!! It is all sugar paste, not real biscuits and teacups!! One of my blogging friends Aurelia has a monthly issue of Stitchy News on her blog Eglantine Stitchery and she mentions several things of interest this month, including a link to this amazing project, Pardalote Solar System Embroidery. It is a stunning piece of work, blackwork in yellow and blue to represent our solar system and all the planets. You have until Saturday 31st August to send a photo of something you have stitched on a Home theme along with a short message about what Home means to you. 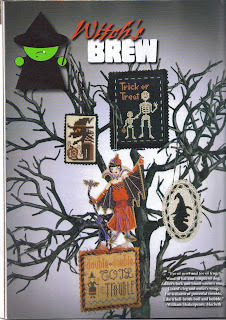 The final postcards will be sent out by 6th September then we can all start planning the Hallowe'en Blog Hop!! August Sunflower Kitty with sunflower button. I thought I'd used 28 count on all of them, but the August Kitty seemed alot bigger. When I measured and counted it turned out that the yellow fabric is actually 25 count evenweave. The July fabric is a hand-dyed 28 so is closer to 29 which made it more obvious. They look ok on the board though. Because we have just returned from my cousin's wedding!! It was a lovely wedding, she looked stunning and her groom was very handsome. The cake was OUT OF THIS WORLD and I will add some photos to the next blog post once I've downloaded them. I started stitching the card first to see what the design looked like over 2 on 28 count but red really doesn't cover well so I stitched the sampler over 1 on the same fabric. The chart is a freebie from Carton-Marie, a French Blog. Here is Mii's totally different verson on her blog Mii Stitch. I thought this was a good opportunity to share some other Wedding Samplers I have stitched over the years. Unfortunately, most were pre-digital camera and there are alot of missing pieces. This is Lavender & Lace Celtic Noel stitched as a bride using my own colour conversion which I did not keep. Sorry! The roses came from Mirabilia's Sleeping Beauty. I just free-styled the placement. This sampler came from a magazine called Celebrations and I have stitched it twice, this version is for my cousin and the other was for friends of my brother. I carefully labelled the back with my name and wrapped it up. 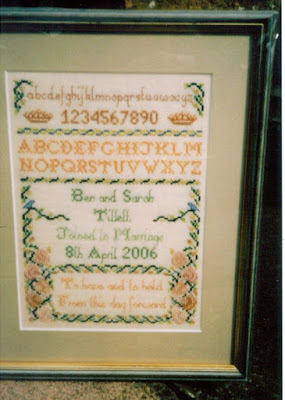 Unfortunately I had forgotten my surname was different to my brother's (I was married) so the poor couple were unable to work out who had stitched it for them!! The mystery was solved when they had their first child and I sent a card. I received a lovely Thank You note only a couple of years late LOL. 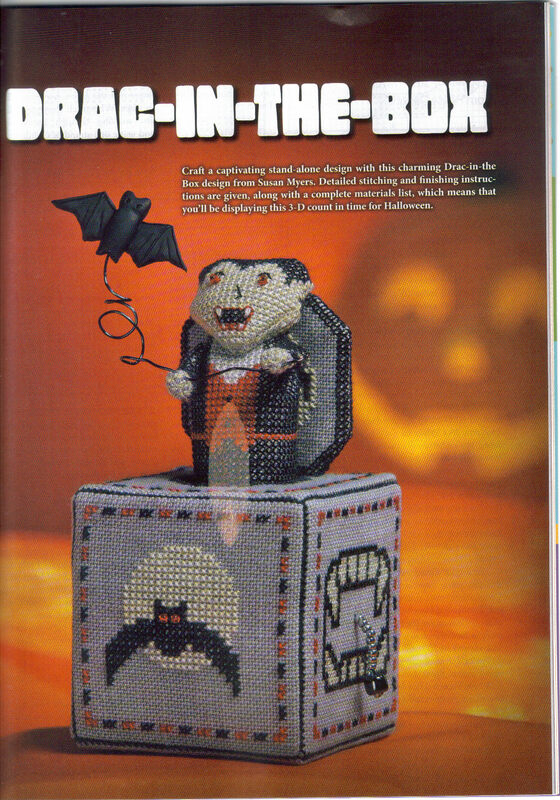 This one comes from Cross Stitcher magazine August 1998. And this is a tiny version of the same sampler. They are both stitched on the same blue evenweave, just the light was different on the day I took the photos. This one is a very special Anniversary Sampler. I stitched it for my grandparent's Diamond Wedding Anniversary, changing the ribbon border to match their living room. There are all sorts of nice details in there, from a mini skein for Cotton to the Ivory lace-making bobbins. I inherited it back when they passed away. I also inherited my Nana's engagement ring which always comes out special occasions so I wore it for the wedding. 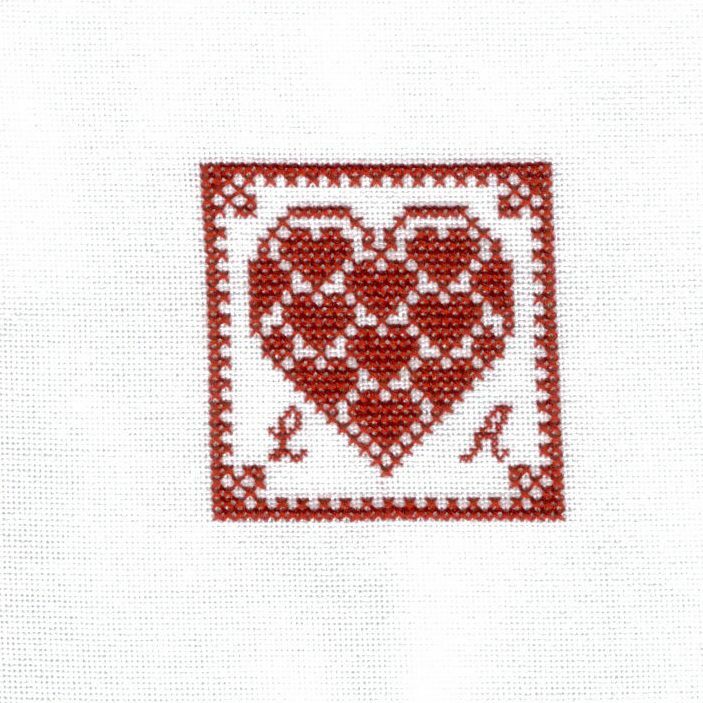 This is a freebie from Passione Ricamo I stitched on red aida for my friends' engagement. I'm still waiting for the wedding!! So that's the round up so far! I finished the whole Couers en Boites design but didn't photograph it before I took it to the framers. 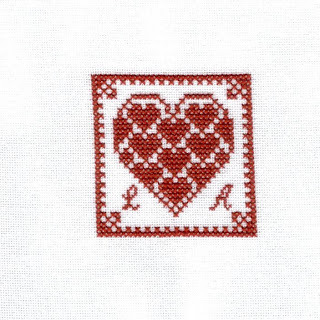 This is just one of the hearts stitched over 2 to make a card for the couple. That's their initials, they're not getting married in LA. That pillow is so bitty and boring. I can't wait to finish it and get on to the drapes. Nora's drapes are one of my favourite things to stitch! Have you seen the new Mirabilia released today? 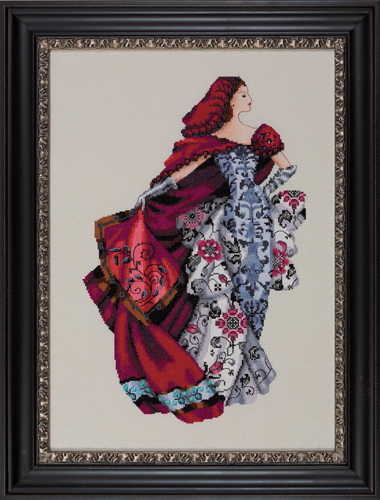 Simply called "Red" she seems to be inspired by Little Red Riding Hood and is amazing!! The Viewer is already working overtime as the Mira Minions try out every combination of fabric with her! A stitcher known as Thutmosis set up the Viewer to help people decide which fabrics to stitch their favourite Mirabilia designs on. She has now expanded it to include Chatelaines, Joan Elliott, Passione Ricamo and Teresa Wentzler all with the designers' approval and blessing. She has fabric from all the major hand-dyers plus plain Zweigart too. The HTML programming necessary must be immense but she does it all for free! All it will cost you is several hours days of your life as you lose yourself in the different combinations. There is still time to send a card if you haven't already done so, just click on the green "There's No Place Like Home" for more details. Remember the box of stash my friend gave me? This design is one she did herself and stitched most of it. 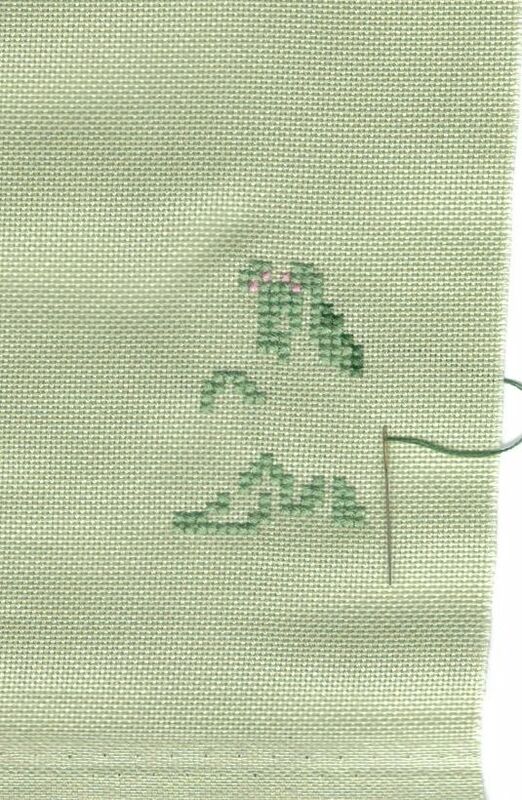 All that was left was some green and the backstitch. So I finished it off and framed it using one the charity shops frames I collected last year. I'm not including this on my list of completed pieces as I didn't really do all that much, but it is nice to show it. If anyone would like the chart then please leave a comment. My friend said I can pass the charts on to anyone who wants them. Sunday is often a finishing day, today I decided to crack on with the JBW cats. I accumulated the backings, the charms and the hanging ribbons but just needed to do the sewing up. And here is Jubilee June all finished up ready to hang on the board. I also completed my cousin's wedding sampler and took it to the framer's ready for the wedding next week. In the evenings I've been stitching away on Andie's piece for the Mirabilia RR. Her theme is The Dreamers and I'm stitching Lilly of the Woods. 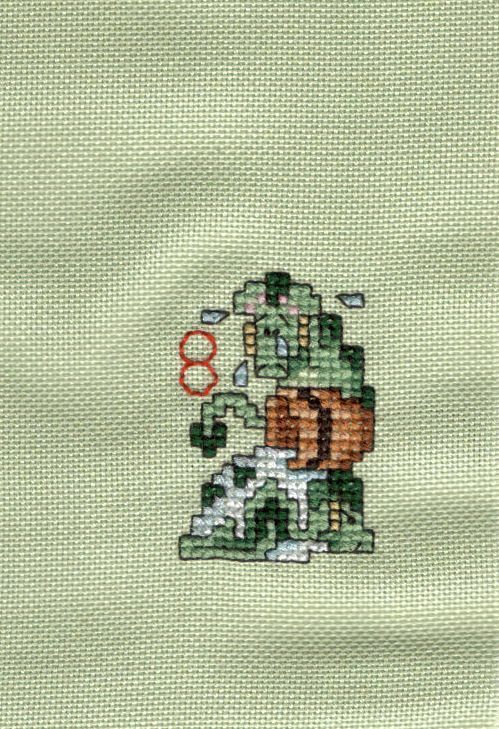 I'm loving this piece, it's great to be reminded what a talented designer Nora Corbett is, her work is just a joy to stitch. The picture in the frame is Brooke's Books' August Cake stitched last year. The gorgeous fabric is Andie's Mirabilia Round Robin piece which landed yesterday and I started immediately. The theme is The Dreamers and I'm stitching Lilly of the Woods. There's alot of red in the TUSAL jar because of Scarlet Letter and my cousin's wedding sampler too. The Summer Postcard Blog Hop continues apace, Vickie's card went to Julie just in time for her Birthday Post, check out her Bagpuss cake!! There's not really much else to report here. Stitching OAAT is my favourite but it does not make for exciting posts! I did try on some hats for the wedding which was fun. My cousins are both 5' 10 or taller so I need a big hat or at least a substantial fascinator so everyone can see me in the photos. I am also behind on mailing things out. I am on a strict budget and during the holidays I have to spend my money on ice-creams and the suchlike for the boys rather than postage for my friends!! So if I have promised to mail you something, it will come, just don't hold your breath LOL. The Large Boy needs a haircut and I've promised him a trip to the cinema to see the new Percy Jackson film too. Today was a cheap day, we went for a walk as far as the local churchyard via the horse fields. The Small Boy cannot walk far so we are limited! The old headstones make very interesting reading anyway and the view over the marshes is amazing. My friend has signed up for this project Gravestone Photos and several of us have said we'll go round with her so she doesn't look like a lone weirdo in a graveyard! We'll just look like a group of weirdos in a graveyard instead. They need volunteers in all these countries too so if you have some free time and enjoy local history why not get involved? 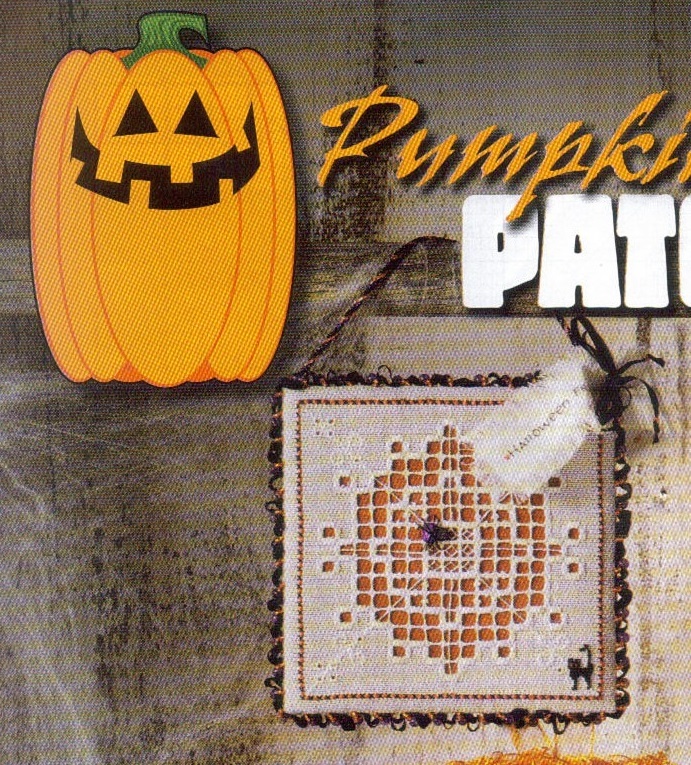 Finally, we have a new FB Group just for Hallowe'en stitching found here. So if you're on FB and love Hallowe'en come and join us! The fabric is quite strange, it's a linen but is very stiff almost like a canvas. It's 28 count and very open too so you can see the thread ends through the weave. I'll wait until I've finished then trim them short. I have decided I still hate lazy daisies (see Papillon Around the World in 80 Stitches). My problem is getting a nice neat loop, it seems to pull straight when I put the needle in the fabric for the final time. I'm continuing with my cousin's wedding sampler, the Couers en Boites design, I added the names today so probably shouldn't show it until it's completed now. This spider's web by Lucy Lyons Willis would look great stitched in black silk thread on a blue-grey fabric. 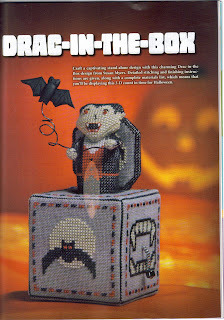 This whole selection is great, the skeletons are made from beads, but the Brooke's Books' Belinda the Bat Witch is just amazing! She's designed to be stitched on perforated paper with her little hat being a separate piece so you can attach it at a jaunty angle. But this is my absolute top choice! I'm not sure if my finishing skills are upto making the figure though but I'm going to give it a go. There are lots of other lovely designs including a great Ink Circles mandala. Those of you more familiar with American designers may be able to tell me, are there more less-well known designers contributing this year? There are alot of names I don't recognise and I've been collecting JCS for a couple of years now. Pop over and say Hi to Vickie and gang.